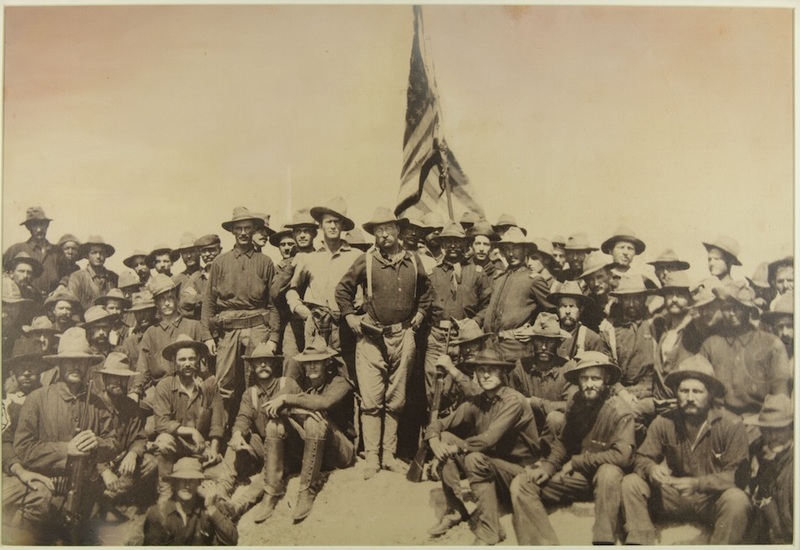 Roosevelt and the Rough Riders atop San Juan Hill, 1898, Theodore Roosevelt Birthplace National Historic Site, New York City. Private letters from Theodore Roosevelt are reminders that Cuban affairs have troubled American presidents and divided Americans since there was an independent Cuba, and that there was an independent Cuba because of U.S. military intervention. He wishes to paint a picture of the San Juan charge, especially covering the part taken by my regiment. I think that what he desires is to go over the ground . . . .
With what you say about Cuban reciprocity I heartily agree, although I wish to add with all emphasis that I entirely understand the opposition from certain districts and States to the reduction of sugar duties. The western farmer is anxious to have the tariff revised in the direction of lower duties upon the so called trust products . . .; and he does not like to have even an appearance of a reduction of duty on a farm product as the first step towards reciprocity. Of course to my mind there are great moral and economic issues of a national kind involved in this Cuban reciprocity business, and I think the attitude of those who have been against me on it is wholly wrong; but it is difficult to convince a man of this when his interests are the other way. A speech in 1918 by Woodrow Wilson, his audience Mexican newspaper editors visiting the White House, acknowledges the asymmetrical quality of the relationship of the United States and the rest of the Americas. The famous Monroe Doctrine was adopted . . . without the consent of any of the Central or South American States. If I may express it in terms that we so often use in this country, we said, “We are going to be your big brother, whether you want us to be or not.” We did not ask whether it was agreeable to you that we should be your big brother. We said we were going to be. Calvin Coolidge, in 1928 in Havana, praised the just-like-us achievements of Cubans. The intellectual qualities of the Cuban people have won for them a permanent place in science, art, and literature, and their production of staple commodities has made them an important factor in the economic structure of the world. They have reached a position in the stability of their government, in the genuine expression of their public opinion at the ballot box, and in the recognized soundness of their public credit that has commanded universal respect and admiration. What Cuba has done, others have done and are doing. In 1933, however, President Franklin Delano Roosevelt, after meeting Cuba’s ambassador, inserted into American considerations of Cuba’s fortunes some dreadful news. [The] President and Ambassador Cintas . . . feel that the problems of starvation and of depression are of such immediate importance that every political problem should be met in the most patriotic spirit in order to improve conditions at the earliest possible moment. The Ambassador is communicating with his Government. Harry Truman welcomed the president of Cuba to Washington, D.C., in 1948 with words that suggest that, for the Americans, Cuba was a more consequential neighbour than the two countries with whom the United States shares a border, Canada and Mexico . No two countries of this closely knit hemisphere have been bound together more closely than the Republic of Cuba and the United States. The friendly bond between them was forged in a common struggle for freedom, and it has continued through all the trials of two world wars and through the many other problems in the political and economic growth of our two countries. There is no relationship which better typifies the firm solidarity of the American States than the traditionally cordial collaboration between Cuba and the United States. In 1960 Dwight Eisenhower thought Fidel Castro’s successes the previous year the successes of a Soviet proxy in the Cold War.
. . . the United States government has confidence in the ability of the Cuban people to recognize and defeat the intrigues of international communism which are aimed at destroying democratic institutions in Cuba and the traditional and mutually beneficial friendship between Cuban and American peoples. The Defense Department, with CIA, will review proposals for the active deployment of anti-Castro Cuban forces on Cuban territory, and the results of this analysis will be promptly reported to the President. A London academic foresees a lot more Cuban cigars being enjoyed in the U.S. Please help sustain our independent, non-partisan and professional journalism by buying a $1 day pass or subscription to Facts and Opinions. An online journal of first-rate reporting and analysis, without borders, F&O is employee-owned, does not carry advertising, and is funded entirely by readers. Click here to purchase a $1 day pass or subscription, from $2.95 per month to $19.95 annually. Subscribe by email using the form on the right to our free FRONTLINES blog.